Lesheba Wilderness (Lishivha) at Ha-Lishivha. The Lishivha community has lodged a claim for their land with the Land Claims Commission. Davhana, Rasikhuthuma (Masakona), Khangale, Nthabalala, Ramalamula, Ramanala, Liswoga, Matamela and Makhado were the sons of King Ramabulana. Davhana was the eldest son and should have taken over the reign. But he was disliked by the Royal Council and chiefs due to the fact that he was seen as a dictator. Most members of the Royal Council preferred Makhado, Ramabulana’s youngest son. Makhado was considered to be brave and was the most popular among his brothers. Makhado’s popularity and bravery, and the assistance he got from Makhadzi Nyakhulu led to his assumption of the Ramabulana kingship. By 1858, there were between 40 and 50 settlers; by 1861 there were more 70 families at Schoemansdal. From here, as tensions grew, whites called for reinforcements from Pretoria. They were given 400 commandos under the leadership of Commandant General Paul Kruger, later to become a leader and hero of the Boers. 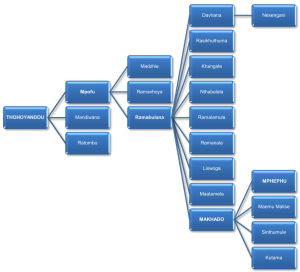 Their task was to dislodge King Makhado from Luatame and establish unchallenged rule over his areas and subjects. Sinthumule became the Prime Minister during King Mphephu’s reign. Sinthumule settled at Tshiozwi and ruled the land known today as Ha-Sinthumule. Ha-Sinthumule consisted of areas such as Tshifhefhe and HaVhangani. Kutama was placed at Tshikwarani and ruled over the land known today as Ha-Kutama. The Boers took over Luatame as Mphephu fled to Zimbabwe. A town was established on 22 February 1899 at Tshirululuni, and Tshirululuni was renamed louis trichardt. Sinthumule was crowned the King of HaRamabulana by the Boers, but his rule was not recognised by Vhavenda. They continued to pay tribute to King Mphephu in exile through Rambiyana and Ravele Matsheketsheke. King Mphephu was forced by the Boers to relocate the Ramabulana Royal Palace to the ancient capital of Dzata (Dzanani). This was due to the fact that areas surrounding Songozwi were declared ‘white areas’ and were turned into white-owned farms. Vhavenda who resided at Magoni, La Ndou, Vhulorwa, Lunoni, HaFunyufunyu, Ha-Liswoga, Phawe, Khavhambe, Ha-Mulelu, Ha-Makhavhu, Ha-Mabasha, Ha-Matshisevhe, etc, were forcibly removed and resettled at Ha-Kutama, Ha-Sinthumule, and Nzhelele. But Songozwi continued to serve as the Royal Court and the burial site of Mphephu Kings and Chiefs, and Sinthumule and Kutama Chiefs. King Mphephu died in 1924, and was succeeded by his son Mbulaheni George. Mbulaheni was crowned King Mphephu II in 1925. King Mphephu II died in 1949 and was laid to rest at Songozwi. Ha-Manavhela was renamed Ben Lavin Nature Resort. The Manavhela/Ramovha community was evicted from their land in the 1960s and resettled at Ha-Kutama. 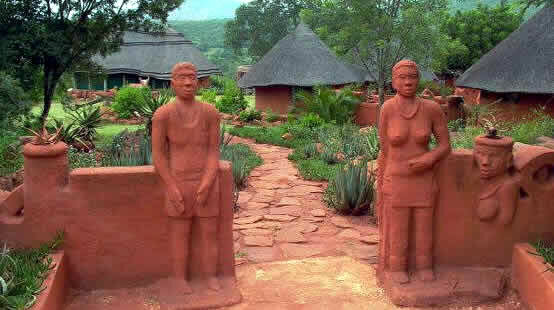 Their new dry and rocky village was also named HaManavhela. Other families were taken to Tshimbupfe and the new village was also named Ha-Manavhela. Other families were taken to a place known today as Ha-Mufeba (named after the name of one of the Manavhela chiefs). Ha-Manavhela was given to a veteran of World War I, Ben Lavin. It was turned into a farm and renamed Ben Lavin. Ben Lavin’s widow later donated the land as a game farm to the non-profit Wildlife and Environment Society of South Africa (WESSA) in 1976. The Manavhela/Ramovha community lodged their claim with the Land Claims Commission in the 1990s. Their claim was settled in April 2002, with 2000 community members from 700 households becoming beneficiaries on a land comprising 2611 hectares. The negotiated joint management agreement, between the Manavhela community and WESSA, regarding the game reserve resulted in the name being changed to Manavhela Reserve.